Deborah Hadfield runs growing Manchester-based design business DNB Creative. 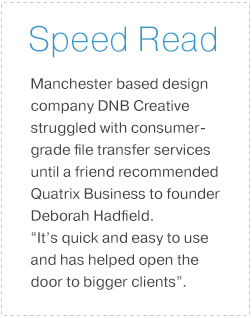 Using a consumer file transfer service to send designs to clients was holding her business back, until a switch to Quatrix from Maytech made all her problems vanish. DNB Creative is a design business providing marketing and web development companies with images, logos and designs that end up promoting some of the world’s biggest brands. So a slick service and professional results are a must. But while Deborah and her team have always been proud of the designs they create and the service they provide, the physical transferring of creative files was a major flaw in the business. Until recently, the team experimented with consumer file transfer services which imposed a series of restrictions and failed to give DNB an adequate platform for improving its brand reputation among clients. "Before we joined Maytech we were experimenting with a lot of consumer services, non of which provided the right service for my business". “We supply print-ready artwork - banners and posters, for example - which are huge files around 100/150 MB” explains Deborah. To exacerbate the problem, DNB clients would have to register with the file transfer service just to receive a single document. This just wasn’t acceptable to some of the big companies that I work with. Then there was the problem of disappearing links: “I would send files and have to request that they were downloaded straight away because otherwise the link would expire after a few weeks,” she says. DNB was also unable to brand these services, meaning it was always clear to clients that documents were coming via a third party. The situation was having a big impact on DNB’s brand, so when a friend recommended Maytech– an efficient service emphasising reliability and ease of use – Deborah jumped at the chance. "It’s just so much better than what I was doing previously, she says. The service is quick and easy to use." "I love the level of control it gives me"
Then there is the security aspect. Deborah believes that Maytech’s relentless emphasis on keeping data secure means DNB will be welcomed with open arms by major new clients in financial services and pharmaceuticals. “Using Quatrix shows I’m as protective over my clients’ designs as they are and it shows I respect the creative files as much as they do. It’s just a much more professional and respectful way of working. I can be more confident with my client base now,” she says. Reach your business’s full potential and send client designs professionally now with your Quatrix free trial or contact our team.